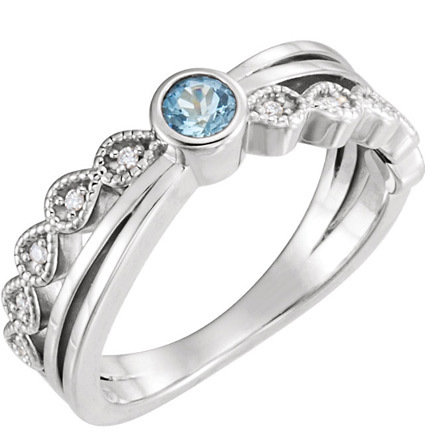 This fashionable bezel-set aquamarine and diamond ring from Apples of Gold Jewelry is a real trend-setter. Unique and alluring meet in 14k white gold and a genuine 3.5mm facted aquamarine gemstone. Real diamonds weigh 0.05 carats in quality G-H color, I1 clarity stones. This ring is available in women's sizes 6.5 - 7.5. Free shipping is included with every purchase in the U.S. (international shipping also available). We guarantee our Trend-Setting Bezel-Set Aquamarine and Diamond Ring to be high quality, authentic jewelry, as described above.